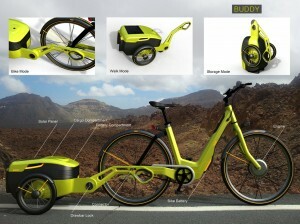 Description The Buddy is born in an innovative concept of design to combine an electrical bike and a self-chargeable trailer. 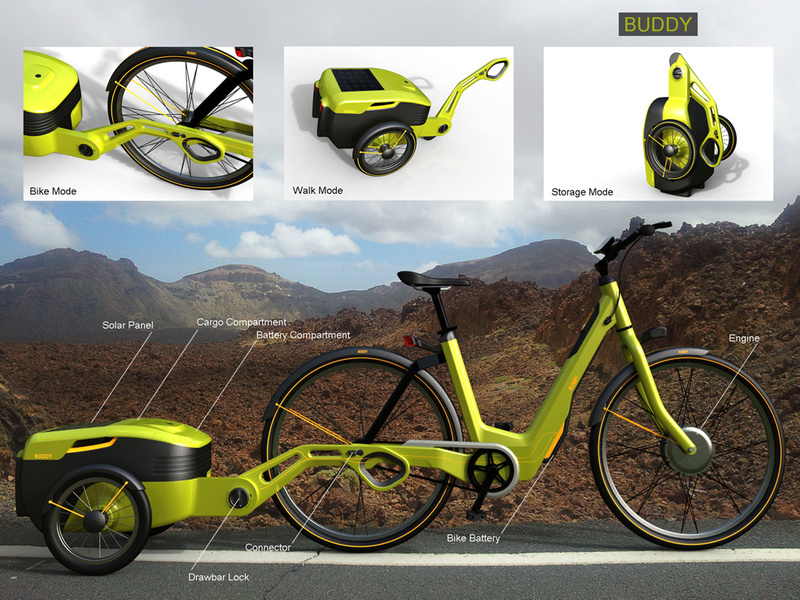 The trailer, which houses two rechargeable modules, is innovative functionally such that it provides the electricity to propel the bicycle as well as to make the bicycle a transportation vehicle for refrigerated objects. 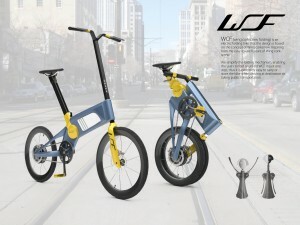 Description WCF is an electric, foldable bike designed based on the concept of a wing corkscrew, which features ease of use by reducing the folding mechanism into one capable of fast folding and deployment with ease. 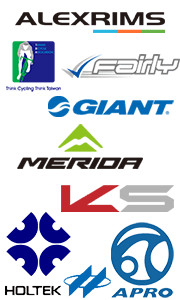 The design is targeted at users with short-distance movement in urban areas as it is easy for them to carry and store when taking mass transit systems and arriving at destinations. 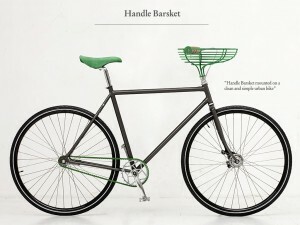 Description Barsket is a new design in urban bike accessory that combines the bike and the basket. 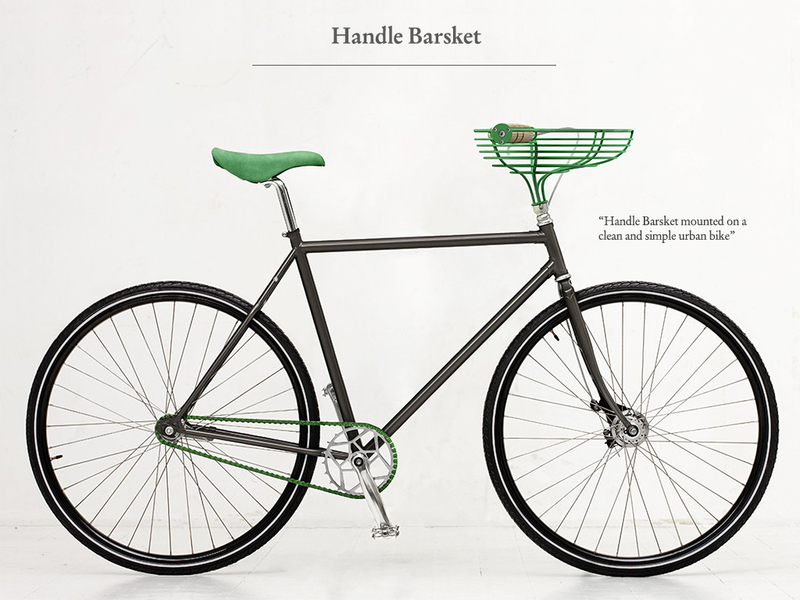 With the brakes and the gear shifting allowed to mount on the handle as usual, the design concept of the bike basket is like a handbag for small items in which the cyclist can put his/her personal belongings and keep within his/her sight. Description Bicycle: D is designed specifically as cargo bicycle to be used in developing countries (such as Congo, Tanzania, and Rwanda). 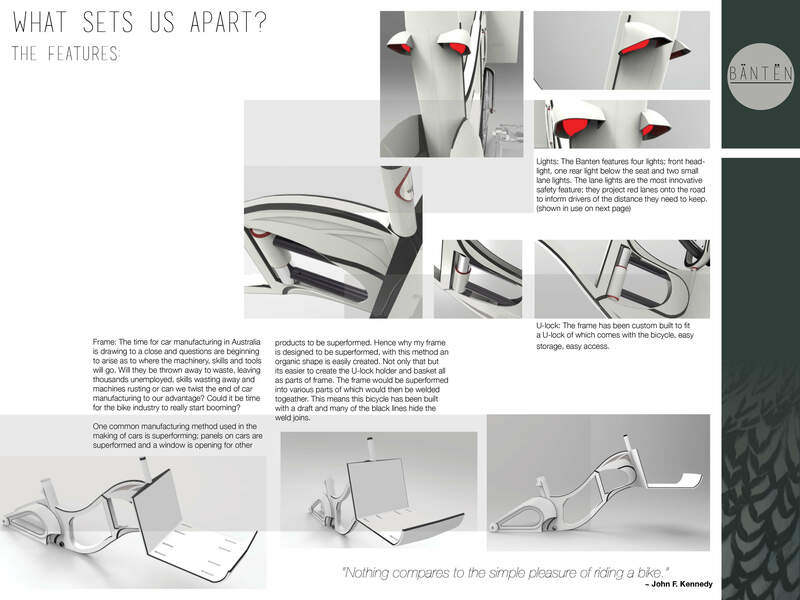 Consideration in designing is not only given to price of product but also to the possibility of structural adaptation of the frame to respond to the demand of cargo carrying. On the the handle bar that provides a live link to oncoming traffic. Twin rear lights are also designed into The frame to increase safety and are used to imitate those of a car. 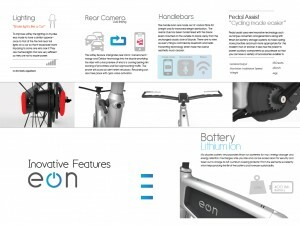 Eon also integrates with pedal assist Motors to follow the trend of the electric bike into the future. 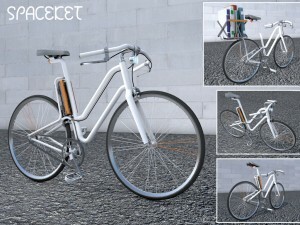 Description SPACEKET is a bicycle designed specifically for commuters and those needing short-distance travels. 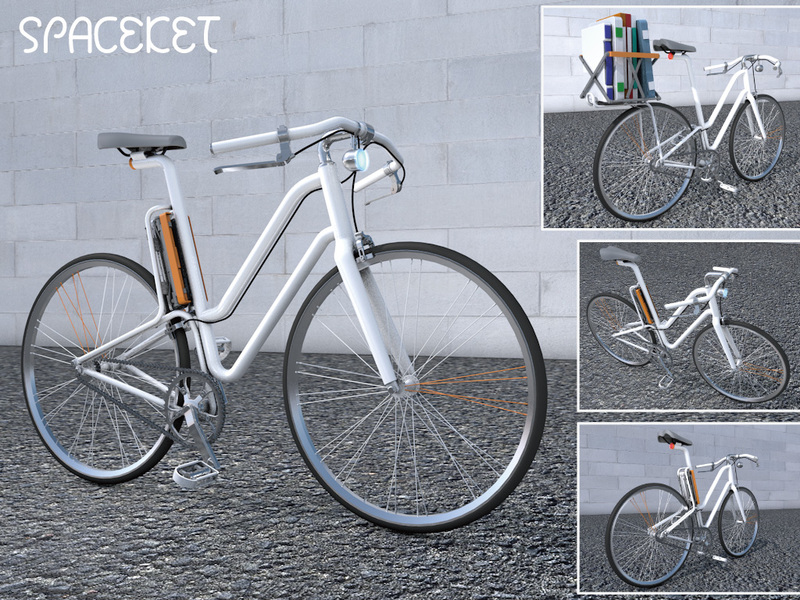 For these persons, there is hardly any better bicycle than SPACEKET to help them, as it uses the space in a leanest and efficient way by means of “folding storage” that integrates both the demand for space and that of the cyclist. 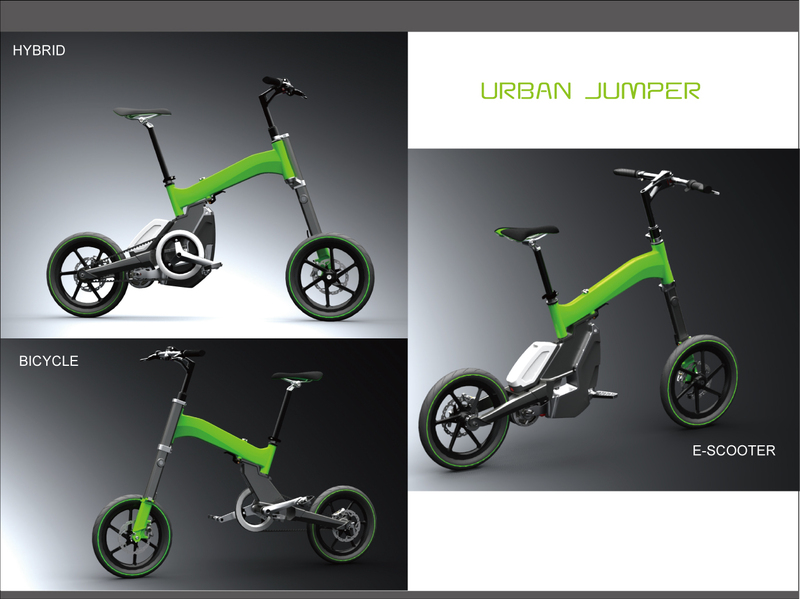 Description URBAN JUMPER is a folding e-bike designed mainly for connecting the public transportation. Its modular design allows 3 modes of usage: Bicycle, E-scooter and hybrid. With detachable power-booster and crank set, It’s easy to switch to the mode which you would like to have each time. 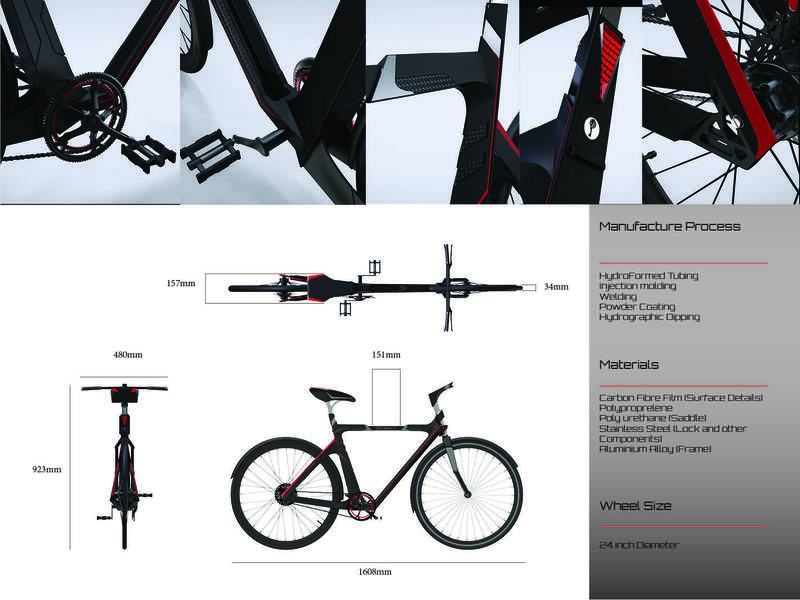 Description A bicycle of new type of structure that, unlike the conventional diamond shape, is created from the concept of a frame mimicking the wings of a flying bird. 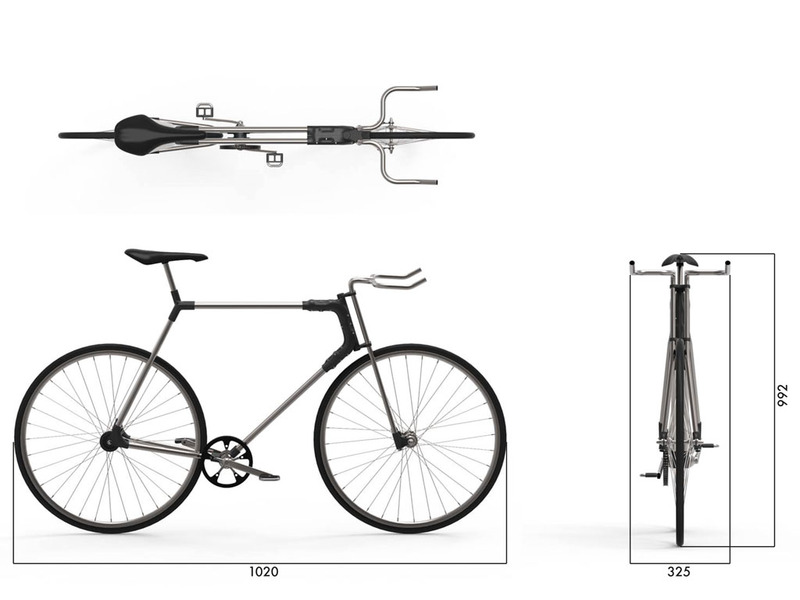 The frame comprises mainly of “steel wires” which supports body weight; and the tubing of the frame owes its streamline design to the auxiliary steel wires to incorporate their function. 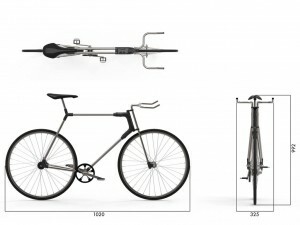 Description The Banten features a moustache handlebar, one headlight with powerful beams sits to the front of the bike, while at the back two small, yet powerful downwards angled lights project red lanes as the rider commutes at night. A storage space with buckles comes with the super formed frame; a U-lock is also incorporated within the frame. Description Citcom was designed to be easily manufactured, so as to reduce production and material costs. 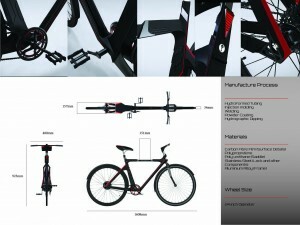 It re-imagines the traditional bicycle frame structure, by combining an alloy twin-tube frame with a plastic lug system. The design is modest, so as to remain indifferent to individual bike styles and preferences, and accommodates a larger buyer market as a blank canvas. 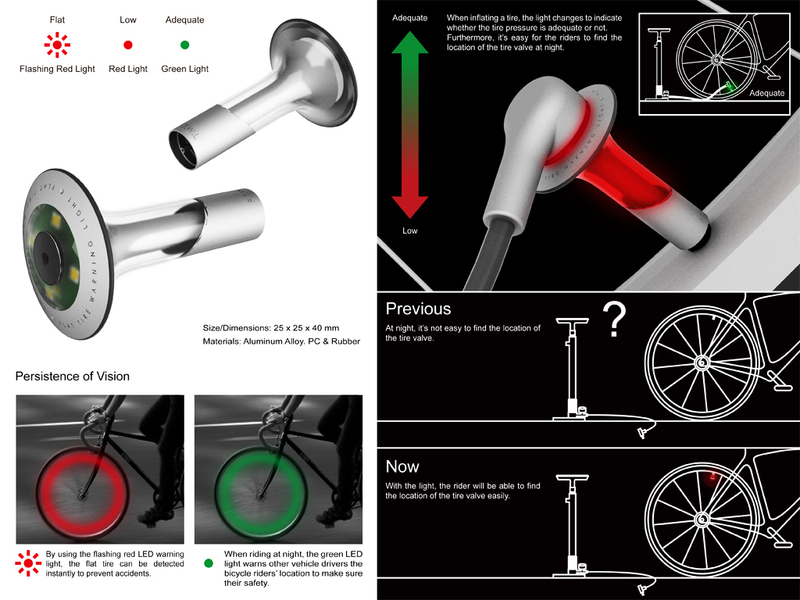 Citcom’s handlebars can be replaced with a variety of bends to suit different riding styles, and the belt drive can be removed by first removing the rearmost lug. Industrial design heavily influences modern design, and Citcom aims to reflect this movement. 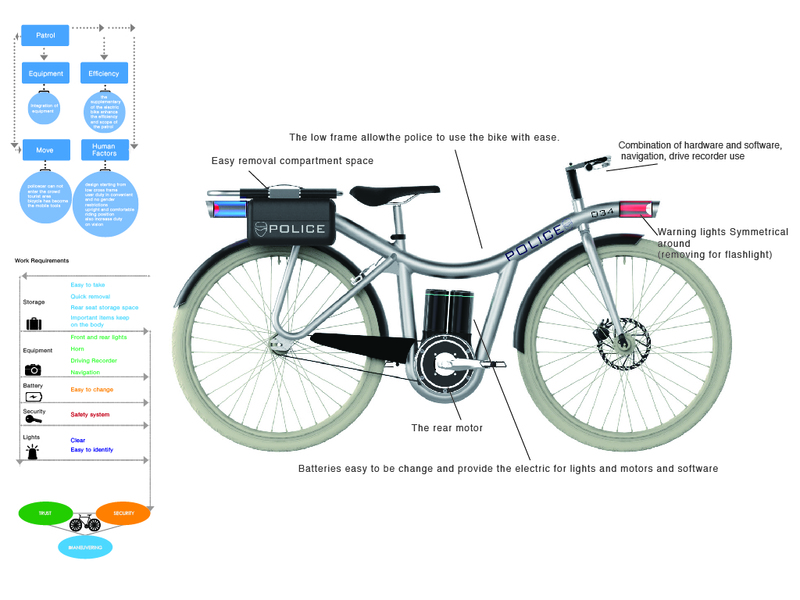 Description The CRUISER is an electric patrol bicycle designed specifically for tourist areas. It carries the hard- and software combination of navigation and camcorder. In addition to the ease of battery changing, the front and rear lamps that are designed in symmetry to be easily recognizable and detachable to become flashlights also provide mobility and convenience, increasing both safety and image in tourist areas. Description LOK is small folding bicycle with 16 inch wheels. 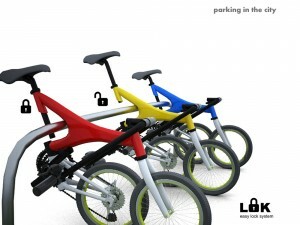 The folding system and saddle transformation allows to lock the whole bicycle anywhere. 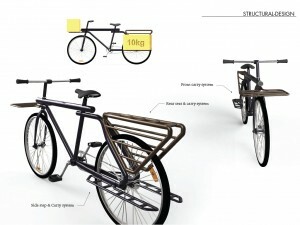 Unfolded bicycles, take a lot of space on bicycle parking areas, so it is not efficient. 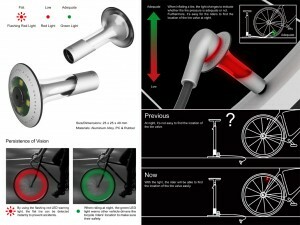 This bicycle uses less space by parking and offers the saddle as a lock. 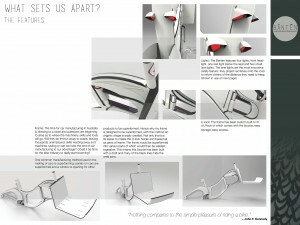 Is designed to fold into a compact form, facilitating transport and storage also. 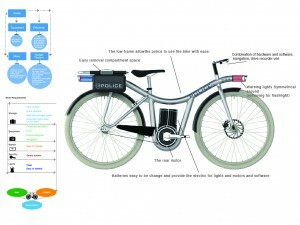 This bicycle enriched with electromotor, could be a new possibility of bike sharing system in the city. 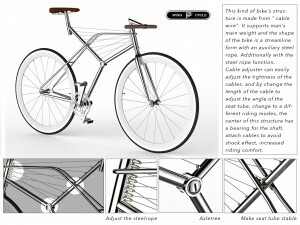 Description The REDBACK is a light-weight aluminum-made commuter bicycle. Its saddle is designed in combination with a concealed compartment for securely storing personal items like keys, wallet, and cell phone. Disposed in the frame pipes is a rechargeable set of batteries which supplies power to the built-in lamps and allows charging other electronic devices through USB ports. 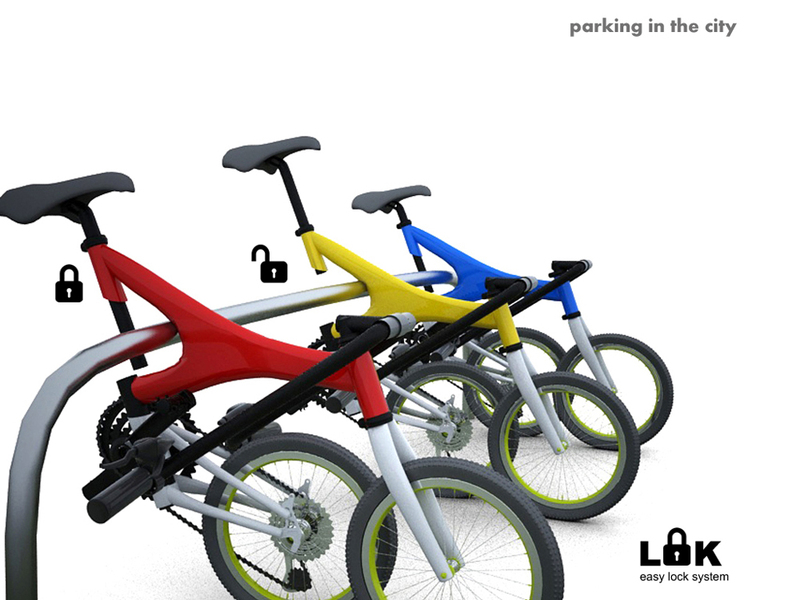 A unique, built-in lock can lock the bicycle to any public bike rack, fulfilling anti-theft function. Description With the X-COLE design getting yourself from the city to those cross country tracks in your small car is made easy. 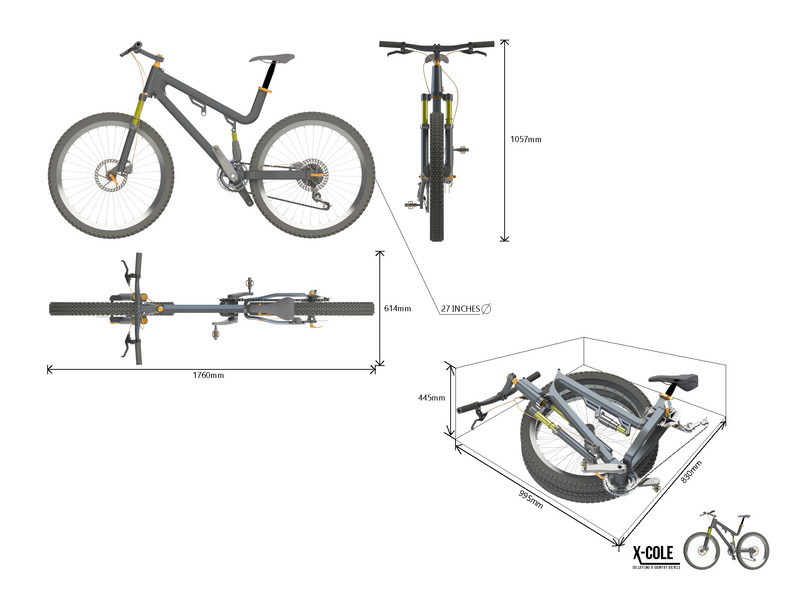 The smart collapsing frame enables you to halve the size of the bike without removing too many components. Including a quick release front tire for extra room. 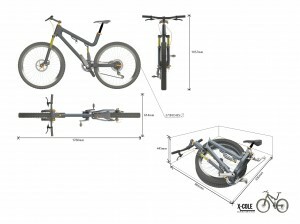 This bike is less awkward to lift and will securely fit in your small car. The X-COLE is a quick system that has only a few steps (with the help of some smart quick clamps and spring loaded components), there’s no wasting time getting out of the car and onto the tracks. Description The Lattice Pedals are constructed from only four pieces of bent chromoly steel wire, a bearing housing and the standard thread connector. The bent wires form a three dimensional lattice that makes the structure incredible stiff while being exceptionally light. (under 200 grams) The unique axis free design replaces the two tiny inside bearing normally used on pedals, with one over-sized, much more wear resistant outside bearing. 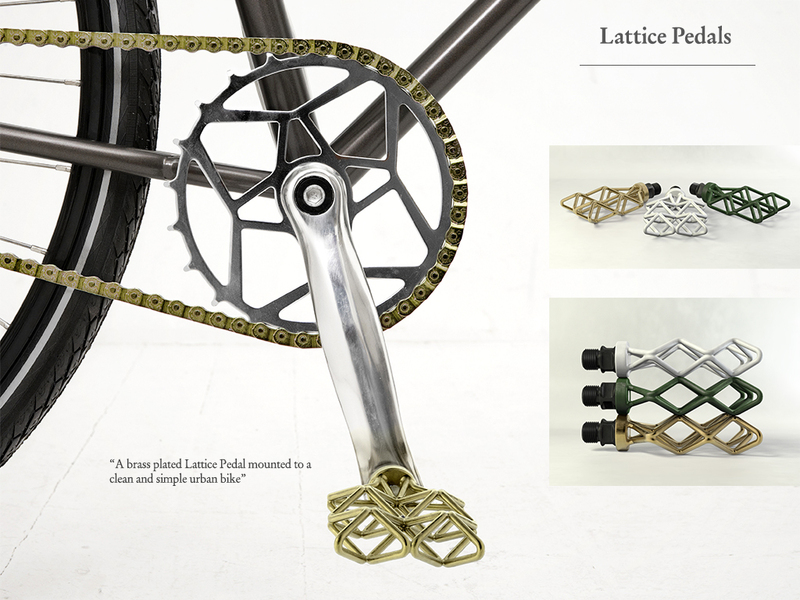 The Lattice Pedals have been specifically designed for the urban cycling market where the bike itself became a fashionable accessory. 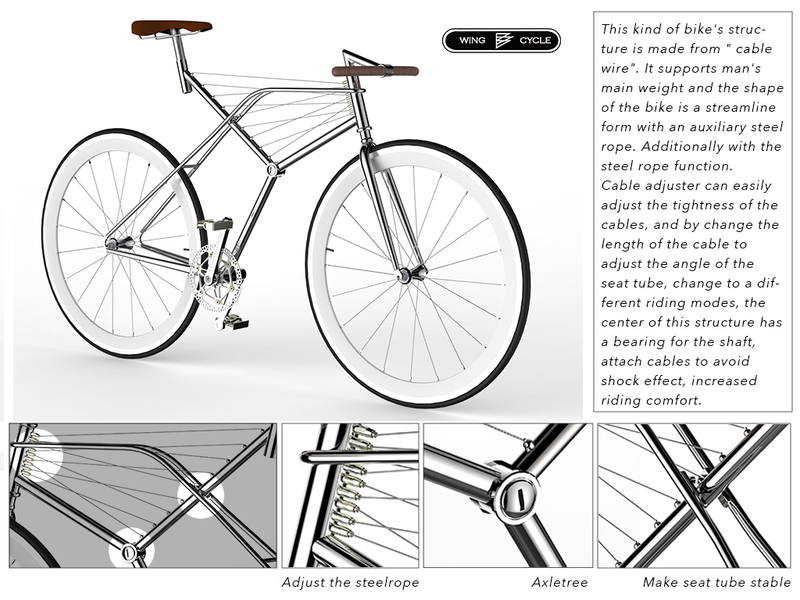 Description The design is for bicycle commuters. When the bike is unfolded, the middle part will be the storage space for briefcases and other accompanying items. After the bike is folded, it can be packed simple by pulling down the storage bag above it to convert it into a bike carrying bag. It allows you to not only easily get on and off the public transportation but also carry directly into the office as a briefcase. Also, converting the vibratory energy into electricity using the vibration power generating chips during bicycle traveling. 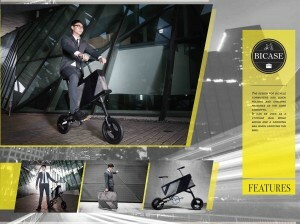 Description Pleasure Infancy is a model of side cart to bicycles designed specifically for strollers. Pleasure Infancy endows babies with the pleasure of riding as well, while their moms can get around, shop, go picnic or hiking with their babies coming along. Pleasure Infancy can be easily dismounted while the user is walking, such that the babies’ motion is not restricted. 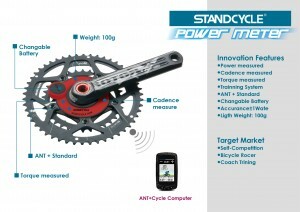 Description Standcycle power meter is capable of measuring and displaying the riding status in a real-time manner. 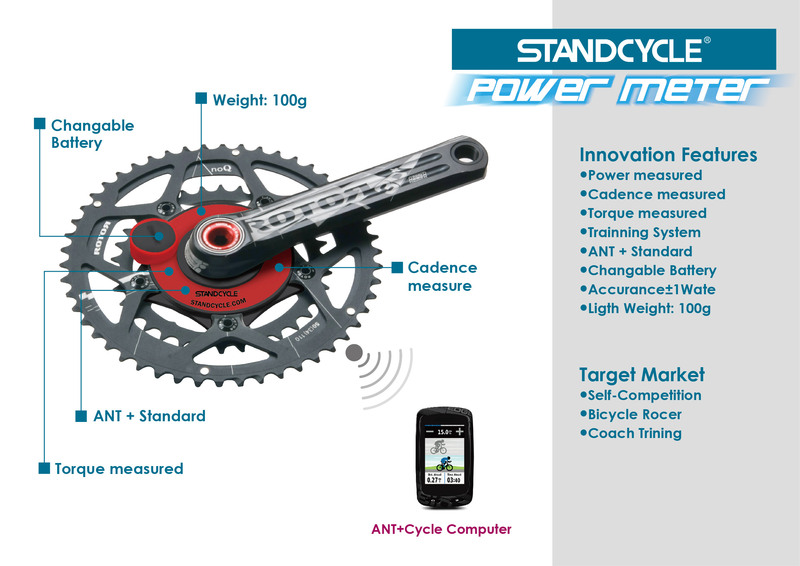 Using the instant data on the power meter, both the coaches and the cyclists can better understand the condition of cycling, allowing them to be able to set out corresponding riding and training programs. It provides the cyclists with more efficient information on riding by avoiding sensing errors and heartbeat strap’s delay in showing heartbeats.